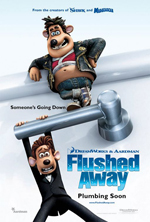 What did you think of Flushed Away? Some readers may be misled by my rating this movie four stars, so I should establish first and foremost that Flushed Away is a kids’ movie. If you’re looking for Oscar winners or violent and bloody action movies, Flushed Away is not for you. However, it is immensely entertaining, fast-paced, and enjoyable, and the four-star rating is based on it succeeding very well for what it is – a kids’ movie. Flushed Away, a film that plays very much like a longer, caffeine-infused Wallace and Gromit, tells the story of privileged pet rat Roddy St. James (voiced by Hugh Jackman), who lives his life in the home of a rich London family. His world is turned upside down by the unexpected arrival of the sewer rat Sid (Shane Richie, in a more-or-less nondescript vocal effort), who turns the tables on Roddy’s efforts to get rid of him by flushing him down the toilet. In the sewer, Roddy discovers an underground rat city, and – quite by accident – becomes involved in a dispute between the pretty, tomboyish Rita (Kate Winslet) and the evil-doing Toad (Ian McKellen), which, of course, becomes wrapped up in the Toad’s nefarious schemes to destroy the rat-city. The animation is CG, as might be expected, but the animators – thankfully for the charm of the story – shied away from the increasing hyperrealism of a great deal of contemporary animated films (look at any of the more recent Pixar offerings, for instance) in favor of a more claymation-style, Wallace and Gromit look. It is really the strength of the story that makes Flushed Away successful, of course, but it is refreshing to see an animated flick that doesn’t concern itself with exactly reproducing every detail of real life. Allusions to famous films abound throughout, along with a great many visual puns and background gags – the filmmakers take every opportunit! y to go for the laugh, from the delightful musical numbers (generally brief and well-sung by the film’s sewer slugs) to the requisite French-bashing, and in general they succeed very well. Parents should be warned, however – there is, especially at the beginning of the film, a strong emphasis on puerile and pelvic humor, perhaps not appropriate for young children. The voice acting is also very strong – Jean Reno in a small role as a French frog (and is it really surprising that the frogs are French in this movie?) especially deserves mention for his diverting performance, stealing every scene his character is involved with. Ian McKellen is also thoroughly enjoyable as the scheming Toad, Hugh Jackman and Kate Winslet are both good as the central characters, and Bill Nighy and Andy Serkis make a surprisingly effective comic duo as two of the Toad’s rat henchmen. One doesn’t really go to see an animated movie for the voice talent, of course – something that the creators of, say, Shark Tale might have taken under consideration – but in Flushed Away it works. Perhaps best of all is the film’s optimism, though. It is, yes, a film for kids, and that no doubt may be a part of it, but however cringeworthy are the usual clichés – the value of teamwork, the importance of family, that crime doesn’t pay – they’re all there, and it’s genuinely fun to watch something that isn’t afraid of dabbling in those clichés. I don’t recommend that you watch this movie if you’re not willing to grow down for an hour and twenty-odd minutes, but if you do it’s an adventure worth taking.